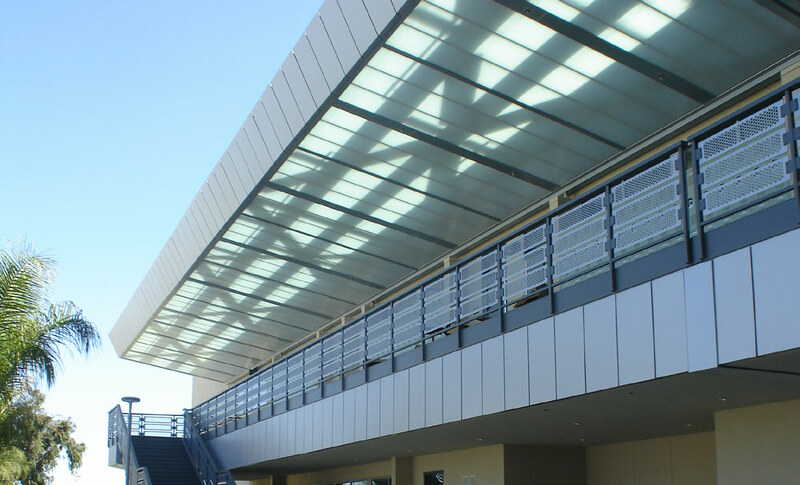 The Costa Mesa High School in California needed an exterior system for it’s new building to help create an open, light filled campus environment while protecting students and staff from the hot west coast sun. Costa Mesa High School 2nd level walkway Quadwall covering. They employed a large translucent canopy made of CPI Daylighting’s Quadwall system across the entire interior perimeter of the new building. The Quadwall system also meets California’s stringent architectural requirements; using a Class B fire-rated roof construction. 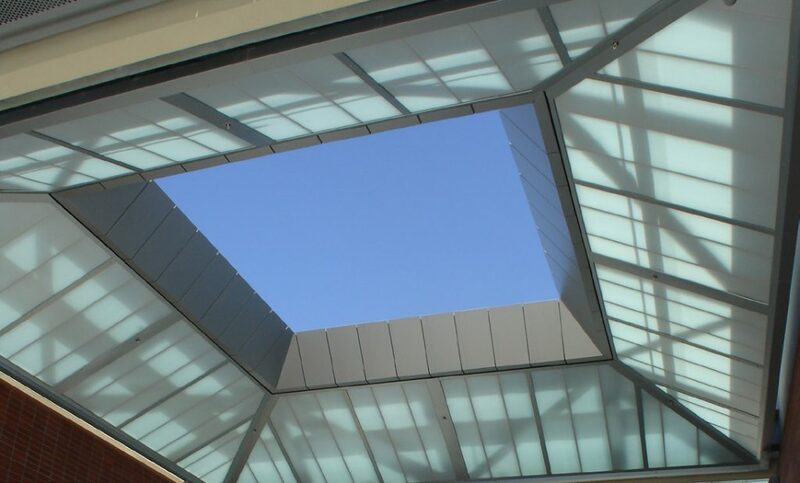 The canopy lets in visible daylight and blocks out infra-red wavelengths (heat) and glare from the sun, allowing the shade shelter in the entry atrium, as well as the second level walks, to provide protection while still being bright and open. The patterns of the steel supporting structure also cast shadow patterns on the covered walks to add another layer of depth to the building, while maintaining clean simple lines. Costa Mesa High School shadow shelter Quadwall covering. In addition to the skylight and fire-rated canopy, translucent wall panels with vision glass were installed in the classrooms to create the appearance of a single system. In total, 7,200 square feet of translucent panels were installed. The Quadwall system is made up of independent translucent insulated panels, resulting in one unified daylighting system. Joined by a mechanically interlocking connection, the dry-glazed Quadwall eliminates the need for adhesives, adding both durability and light distribution via the tight-cell technology. The system can be configured with additional insulation, sound reduction, dynamic shading, additional structural performance, military forced-entry resistance, or Class A and B fire-rated roof assembly. Being able to customize the panels in ice white matte on the interior and green on the exterior in coordination with Costa Mesa’s colors was an additional selling point. And should the school ever opt to change the exterior color, Quadwall’s removable skin technology enables this at a minimal cost. Thanks for this Article. This was really a helpful post for me.. I am really looking forward for this stuff.